It is at this point in the year, many soccer players are planning out their summer and are deciding which camps, clinics, or colleges they will fill their summer schedule with. Throughout the summer schedule, feedback will be received from a variety of sources; club coaches, high school coaches, college coaches, primarily coaches at every level. Then there is the feedback these athletes receive from their parents. All of this feedback is to be internalized, during this internalization, confidence can be built or taken away. Use these 3 questions below to build confidence as a soccer player. As you ask and answer these questions below, it is going to put you in a position to be able to receive feedback and use it to build your skills, rather than allowing it to destroy your mindset. A vast majority of competitive athletes can describe their weaknesses and where they need to improve but rarely take the time to explain their skills and strength they would offer to a team. This is an essential part of the process of developing unshakeable confidence. Do not just answer this question in your mind, go through the physical act of writing out your strengths. A large number of competitors will read this article on a handheld device, take the time to open up the NOTES App and describe your strengths. Break these strengths into on-the-field strengths, personality strengths you bring to the team, and strengths you have on a personal level that you find interesting. This is not a time to be modest; if you are going to compete with confidence, you must know who you are. The weak competitors try to become a person they are not or try and do things in a competition they have not prepared for. This question is really two parts because you can answer it with a Yes or No. If you answered YES, excellent, now write everything down you have done. I mean write everything down. What have you done physically to prepare? What have you done to prepare mentally and emotionally? How many hours of sleep are you getting? What have you done to make sure you are prepared nutritionally? If you answered NO, you should thank yourself for being honest and then get to work because there things you can do to be prepared. What do you need to do to prepare physically? What do you need to do to prepare mentally and emotionally for competing at your best? What do you need to do to ensure proper sleep for recovery? What do you need to do to ensure proper nutrition? There is no substitute for preparation. We could stop right here with this statement, but GREAT Competitors go through the process of writing everything out they have done to prepare for the challenge. Great Competitors look at situations as challenges, they embrace the challenges, because challenges are what push us to become more. Q3 – How have you pushed yourself to failure? Failure is not fatal. As a Competitor, we must understand that we can be pushed to physical failure and the world has not crashed down around us. You see, if we push ourselves to failure, we are sending the message that we can go to the limit and be ok. While we are pushing to this limit, we are actually moving this limit a little further ahead. Thus we are developing physically, mentally, emotionally, and spiritually. Pushing yourself to failure creates the comfortable nature of receiving constructive feedback. Constructive feedback is what you are going to receive at Future 500 from the college coaches, and the college coaches are evaluating you in EVERY aspect of your performance, and I mean EVERY aspect of your performance. You will receive feedback on your physical performance, including physical skills and tactical skills, but the most significant evaluation that is being recorded is your response to everything that is going on around you. How you respond to everything that occurs around you, including the feedback from college coaches is a large indicator as to how you will respond to everything in your competitive life. Jeffrey Swarr is a Performance Enhancement Coach working with individual, teams, and businesses on performing at their best. He is the owner of Heart of a Competitor, LLC, a consulting practice, and the author of A Competitor’s Heart: 369 Days of Development. This book has been the guide for countless Competitors of all-ages to build their competitive mindset. 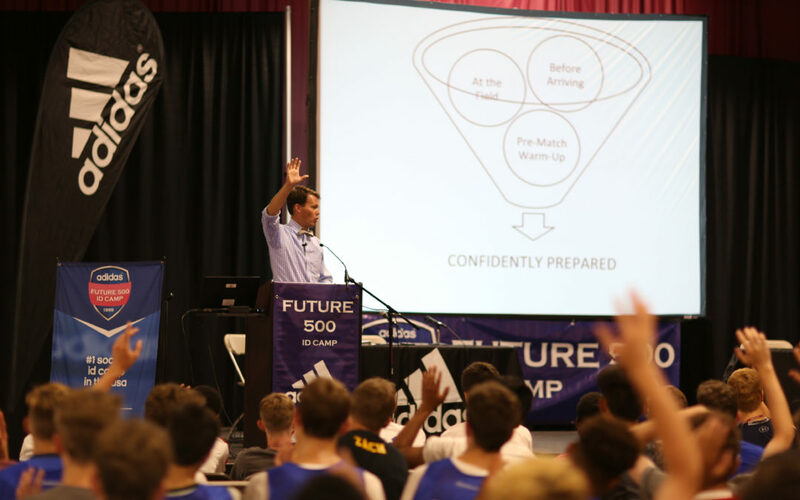 Jeff was a guest speaker at Future 500 ID Camps in 2017. You can learn more about Jeffrey at www.jeffreyswarr.com, on Twitter @mr_swarr, or instagram @mr_swarr.